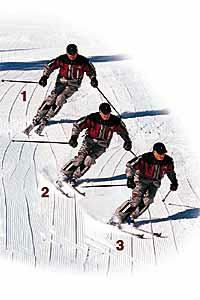 Two options for fat-footed folks looking for a super-smooth flex on the ski hill. Ski boots used to be discriminatory. Stiff flex ratings were associated with narrow lasts, meaning fat-footed hard chargers needed to spend time and money at the bootfitter punching and grinding plug boots to make them remotely comfortable. Those days are long gone, and now the two largest 3-piece boot brands offer stiff, wide-lasted boots to accommodate those of us with feet commonly mistaken for swimming flippers. Full Tilt’s Flexon system has a devoted following, including the likes of Seth Morrison and Bode Miller. The brand’s Descendant series is unique, however, as it features a 102mm-last Evolution shell. Toss in the included Intuition Pro Liner, and you’ve got a high-performing, wide-lasted, three-buckle boot worth checking out. Our Gear of the Year 2018 award went to the more-approachable 120-flex version of the Panterra line, but, since I am a bigger guy and a strong skier, I was drawn to the intimidating orange and black boot with a stiffer flex. Featuring four buckles and a cabrio three-piece shell, plus a walk mode and a last that can be adjusted between 100-102mm by simply using the buckle over the toes, the Panterra has a few more bells and whistles than the Full Tilt Descendant in terms of adjustability and comfort. Ski boots are incredibly subjective, and really require a proper bootfitting. But, if you know you have wide feet and desire a smooth flex only available in 3-piece boots, both of these options are worth checking out. The Full Tilt Descendant 8 had the best fit out of the box, plus the Flexon construction is consistently predicable in terms of on-hill performance. The Intuition liner was initially more comfortable than the Dallbello ID Liner, but the ID liner got better with time. The more I skied in both boots, the more the Panterra stood out in terms of sheer function, especially after breaking it in over a few days on the hill. With performance that gets better with use, a walk-mode, and easy on-the-fly adjustability, the slight overall advantage goes to the Panterra 130. See more men&apos;s all-mountain utility boots from 2018 here. Note: Both boots were fit at Larry’s Bootfitting in Boulder, Colorado. With ski boots, don’t just stuff your foot in and go. Go to a professional bootfitter, get a consultation to compare with your research notes, get the right boot, and get it fit properly to have the best experience possible while skiing. You work hard at slaying the whole mountain, but you’re ready to take a step back from black toenails and frozen feet for bell-to-bell comfort. Skiing is meant to be fun, right? At the flip of a hike-mode switch, you’re ready to trek beyond the boundaries in search of fresh snow and untamed terrain. Or, you know, just be a lot more comfortable hanging out in the bar. Power. Precision. Pure control. For demanding experts, these boots unapologetically deliver the goods. Visit a bootfitter this season to make every part of your skiing better.